A very cool action movie that doesn’t have a whole lot going for it in terms of story, but certainly rocks in terms of spectacle, excitement and effects. Here is a movie that knows what it is, knows who its target audience is, and completely delivers all that one would really hope for it. This film is big on action and spectacle, and does a fine job with character and story. Is it overcrowded with characters to the point where most of them don’t get the opportunity to really shine or get a backstory? Yes. But we do get all that we really need from the characters. The cardinal mistake (well, one of them,) that these types of movies tend to make is developing the characters so much that the monster is left in the background. Not so with this film. The other cardinal mistake is holding back on the monster to reveal him a little bit at a time. Again, not so here. Kong: Skull Island avoids all the usual pitfalls to give us a pretty exciting action creature-feature. It is even smart enough to include a bunch of other creatures on the island, besides Kong, making this in many ways a monster vs. monster movie. The plot might hit some corny spots at times, but the action really works! We have certainly come a long way in terms of monster and creature movies. 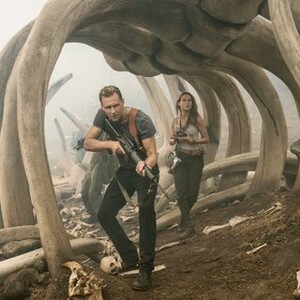 In the past two years or so, Pacific Rim, Jurassic World, and now Kong: Skull Island have taken anything that previous creature films could have done, in terms of spectacle and size, and brought them to the next level. There’s no comparing Peter Jackson’s King Kong movie to Kong: Skull Island, for example. The movies are only about a decade apart, but they feel like they’re from different lifetimes. And this is a very good thing. Because we are at the point now where these movies don’t have to feature amazing plots or characters (the way the original Jurassic Park movie did,) and can still be a whole lot of fun. 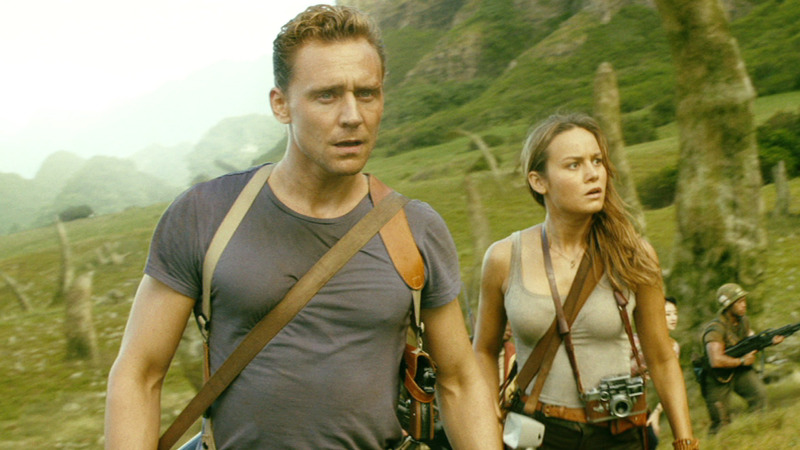 With Kong: Skull Island, what we get is a movie that knows what audiences want to see and makes sure to give it to them. Unlike numerous other creature films that hold the monster back for as long as they can, and show the creature a little bit at a time waiting until at least the halfway point to show it in its entirety, this movie gives us a look at Kong fairly early. And not just Kong. In this film, just like in the recent Godzilla movie with Bryan Cranston, we get a number of different monsters, and they are all pretty cool. Before we get to the island, however, there is some setup to be done about the characters who will be going there. All of it is done in the quickest, and yet energetic way possible. First we meet the scientists. There’s Bill Randa (John Goodman) and Houston Brooks (Corey Hawkins.) These guys work for Monarch, the organization we met in the Godzilla movie (these films are part of a shared universe that will soon be leading to the movie Godzilla Versus Kong.) They are searching for MUTOs (Massive Unidentified Terrestial Organisms.) In their introduction scene, these boys go into the White House to get approval from a government representative (played by the great Richard Jenkins,) to go on a mission to an uncharted island. They mention that the island is similar to the Bermuda Triangle in the way that it is unexplored and mysterious. From here we meet Preston Packard, the military commander who will be going on the mission. His latest operation has come to an end and he and his men are ready to return home. Packard sits at a desk looking pretty depressed. He’s clearly a man who has nothing to look forward to, and he’s even questioned about that by one of his soldiers, who asks if he’s going to be okay. Then Packard gets the call to go to the island. This gives him new hope. We also meet the team he will be taking with him, including Jack, Mills, and Cole. These guys are played by talented and recognizable actors like Toby Kebbel, Jason Mitchel, (Straight Outta Compton,) and Shea Whigham (Silver Linings Playbook.) The only problem here is that with such a huge cast, there just isn’t enough space to develop their characters. The only story we get for the three of these guys is that Jack (Kebbel) has a son he writes letters to, that he wants to get back to. Part of the reason there’s no backstory for the soldiers, is because we still have three other main characters. There’s James, the anti-hero, Indiana Jones type, explorer. Then there’s the girl, Mason Weaver (played by Brie Larson, who is really just there to be the girl,) and finally there’s the strange and stranded guy they meet on the island, Hank Marlow, (played by John C. Really.) Boy does this make for a huge cast. So much so that James and Weaver become the stars as the movie goes on, (they are the ones who develop a relationship with Kong and become the heroes,) and the scientists who started the movie get pushed to the background, to the point where we pretty much stop following them altogether. This might an unconventional approach, to have the main characters change, about halfway through, but in this movie it works. It works because we don’t really care about any of the characters, especially not the scientists. So if the movie wants to use those scientists to help set everything else up until we can get our footing and find some more standard characters, then that’s okay. The other reason why this main character switch works is because this movie is not about character. It’s about Kong. That’s all we really care about. If Kong is great, then the movie is great. 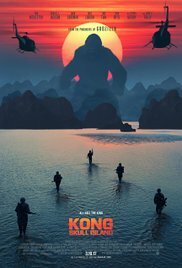 And the more a movie like this tries to bog itself down in terms of character and back story, the less it becomes about Kong. Luckily this movie knows all that and doesn’t make any of those cardinal mistakes. When our characters get near the island in ships, a giant fog filled with lightning or explosions of some kind comes into their view. Whatever it is that’s blocking their path to the island, it’s not going away. So they abandon the ships and take to helicopters, piloting them through the fog, through a storm, and out to the island. When they get to the island, there is a massive attack of Kong oil the choppers. He throws logs at them, swats them down, and basically takes them apart. Tons of soldiers and scientists are killed and only a handful of them survive. The survivors are now the characters for us to follow. These characters are separated into all different groups and combinations, and we jump back and forth from on to the other. As different groups, they encounter different strange things on the island, including a giant horned buffalo-like creature, and the Hank Marlow character, who comes with a tribe of armed men. He tells them about how Kong is their god here on the island, and how Kong protects them from what else is out there. Then we get to meet the creatures that make up what else is out there. There’s a giant spider which attacks the soldiers by stabbing them with it’s huge legs. Then there’s a stick creature which is housed by a log and rises up out of nowhere, completely camouflaged by it’s surroundings. There are also terradactyls who rip people apart and of course, the Skull Eaters, which are the big threat in this movie. The biggest one is saved for last, and becomes the big bad of the movie. The creatures are probably the coolest thing about this movie, and you can tell that the film put a lot of time and effort into figuring them out. These things are ferocious and scary as hell. They are also a great deal of fun to watch. Kong Skull Island is a movie that knows what its target audience wants to see and delivers as often as it can. When Peter Jackson made his King Kong movie, he was going for more of an art house, or at least artistic vibe. His characters didn’t even make it to the island in the first house. Kong: Skull Island is very different. This movie is wall to wall thrills. From The Vietnam War music intros, which are basically one hit song after another, fired off at a rapid pace to really getting the momentum going, to the quick journey to the island, this movie wants to get us to the monsters as quickly as possible, and that kind of attitude really works. Especially since the monsters are so creative and cool. There are definitely some parts of the movie that are corny, (the Brie Larson character Weaver gets a little too close and friendly with Kong, for example,) but overall this movie is a lot of fun. It delivers on the action, excitement, spectacle, and thrills, and that’s really all you want from a movie like this.